Henley Camland has just completed the purchase of Eastern Quarry at Ebbsfleet in Kent and sold parcels of land at the site for 2,900 homes, in the space of a week. The joint venture between Henley and Camland, which specialises in preparing complex sites for development, bought the 665-acre site from Landsec for £66.8m and then agreed to sell land for 2,600 homes to a partnership formed by Countryside and Clarion Housing Group, and land for 300 homes to Barratt Homes. Henley chief executive Ian Rickwood (IR) and Peter Nelson (PN), managing director of Camland and project director for the Eastern Quarry, tell Property Week about their plans for Ebbsfleet and their ambitions to rapidly grow their pipeline of projects over the next two years. What more can you tell us about the plans for the Eastern Quarry site? PN: There is planning permission for 6,250 homes across the three villages that make up the Eastern Quarry. The range of housing goes from one- and two-bedroom apartments right up to five-bed housing. It’s a full mix of starter, affordable and family housing. We’re also including some private rented sector (PRS) housing on the site as well. We may choose to sell the PRS to a third party or we may choose to develop it ourselves in conjunction with a long-term fund. What is your timeframe for delivery? PN: The whole development will take between 10 and 12 years to complete. We think, pretty soon, we’ll be delivering 300 to 400 units; at the moment we are around 250 units and we think we can accelerate that. IR: PRS will come along probably in the fourth or fifth year of the development. We are not just building houses here; there is the social, community and commercial infrastructure to put in place. For the rental homes we need to have the retail and the social scene in place that the PRS market would demand. 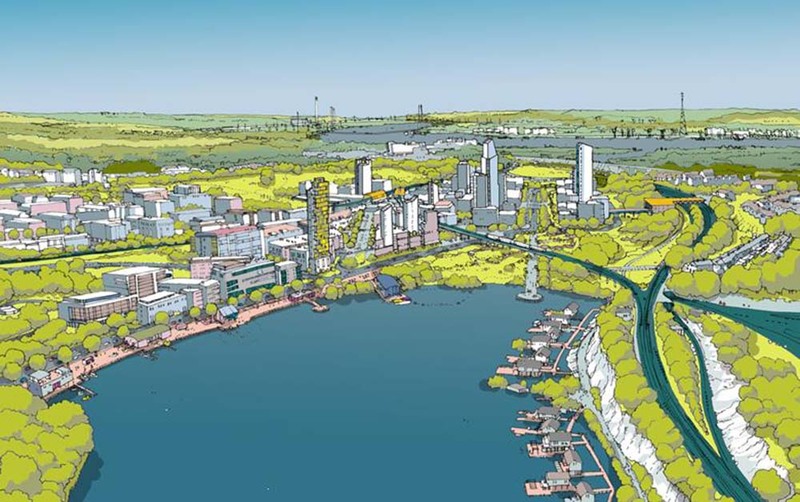 Do you plan to continue working together on projects outside Ebbsfleet? IR: The plan for Henley Camland is to get to the point where the business is working on 20,000-plus land parcels across the UK and maintaining that level each year. The JV is working on around 6,000 parcels of land. Reaching our target will take us longer than we’d hoped simply because these deals are incredibly complex. It takes a long time to negotiate all the constituent elements. Our intention is to achieve our goal over the next couple of years. If deals are so complex, why pursue them in the first place? IR: There aren’t many people in this space. That’s why Henley was attracted to it. We tend to look for distress, dislocation or arbitrage when buying land. We like this space because there is dislocation. Around 10 or 15 years ago, housebuilders were happy to acquire lots of land and hold it in a large land bank and roll it out. While they still do that to a degree, now they are trying to work their balance sheets more efficiently post financial crisis. They are more interested in buying parcels where the land is fully serviced, making it an efficient use of their capital. It takes the risk out of the purchase of them. Housebuilders also face the threat of being penalised by the government for land banking. I know there has been talk for a while and no action, but if the government does proceed, it will create a dislocation where housebuilders are cautious about the amount of land they hold for fear of political interference. This creates a great opportunity for an operation like ours, with experts like Peter and his team who understand the delivery of serviced land, to slot in between the landowner and builder and de-risk challenging sites.